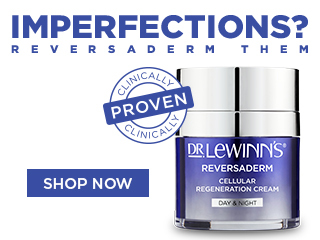 Treat yourself or someone you care about with Dr. Lewinn's Eternal Youth range, formulated with Juveleven™, a powerful hexpeptide that helps rejuvenate skin cell appearance by 10 years. Eternal Youth helps to slow down the visible signs of ageing, leaving skin looking and feeling rejuvenated. The Eternal Youth Day & Night Cream is a luxurious and fast absorbing cream with Juveleven™, a powerful hexapeptide that helps to rejuvenate and boost the appearance of skin. Contains rejuvenating Vitamin A and PatcH2O™ for intense moisturisation lasting 48 hours. This cream also contains Diamond and Black Pearl to help achieve a youthful complexion and is suitable for all skin types. Leaving skin feeling and looking revitalised and rejuvenated. The Eternal Youth Skin Polishing Exfoliant is formulated with Juveleven™, Activated Charcoal and Green Tea, it creates a flawless and refined complexion, preparing the skin for improved absorption of moisturising treatments. Free from any harsh, abrasive ingredients, it polishes the skin thoroughly and tightens pores to reveal a fresh and glowing complexion. Contains biodegradable natural exfoliating beads. Suitable for all skin types. Ideal for use in the shower. Apply to dampened face and neck area with wet hands and gently massage in circular movements with fingertips, particularly around nose, chin and forehead areas. Rinse well with water and pat dry. Use twice a week for normal to dry skin, or 3 to 4 times a week for combination to oily skin. Avoid direct contact with eyes. Rinse immediately if contact occurs. We recommend patch testing before use. For external use only.